Esta propriedade é a casa de família original da McDonald, a 20 minutos da linha Yellowstone Park, 25 a 30 minutos para pagar uma cabana em Gardiner. * o alojamento - 6 quartos / 4 casa de banho com capacidade para 12 pessoas, mais se necessário a um custo extra; 6500 pés quadrados. Suíte King Master com caminhada em banho de pedra, banheira de hidromassagem com belas vistas de montanha / prado, pia dupla, closet e deck superior da varanda. 2 º andar. * cama de solteiro em 1 dos quartos queen com 16 'parede de escalada e corda. * Quarto queen antigo com banho anexado, muito confortável / aconchegante. 2 º andar. * Cama de solteiro na área de treino loft. 2 º andar. Perto da sala da rainha antiga. * O térreo principal do piso térreo é uma cama queen na área da sala de recreação. 1 casa de banho no térreo. * Lá embaixo é área do piso principal com cozinha, sala grande, caminhar para decks, quintal, estacionamento, etc. * Cozinha ampla com estações múltiplas, todas equipadas com tudo, 2 pias, 2 geladeiras, forno duplo, muita área sentada. Abre a sala de jantar com 6 cadeiras na mesa. * Abra uma ótima sala com sofás grandes, cadeira reclinável de couro e lareira de pedra grande. Há 72 janelas no lodge, as vistas são bonitos e abundante. Lavanderia com LG frente carga lavadora / secadora. Lodge feitas com troncos de até 40 polegadas de diâmetro. O grande deck na frente abre para o verdejante jardim verde com sprinklers automáticos, uma fogueira, mais terra para se esticar, e um trampolim de grande qualidade com rede de segurança. Pontos de vista de montanhas do parque de Yellowstone, prados, animais selvagens, florestas, e da companhia de amigas cavalos, gatos, cães, vacas da nossa fazenda. Nós gostamos de pensar que você está vindo para se afastar de tudo e esperando que você não se sinta tentado com o cabo e o wifi. Deixe-nos saber se você precisar dele desconectado. As famílias afirmam vincular mais quando não são tão tentadas. O serviço de celular não é o melhor na área de Montana ou Wyoming do parque, e a Verizon é a melhor cobertura. NO serviço de celular nas montanhas no rancho. Nós temos um celeiro log e arena indoor anexado acima do lodge superior na colina apenas para uso privado. Muitos clientes vêm assistir as meninas do rancho cavalgar e corda na arena quando eles acontecem para estar entre rodeios, visite os gatos no feno, e as vacas em miniatura nas canetas. Os animais menores são escritas pelo celeiro e arena para a sua protecção contra os animais selvagens. Temos um rebanho dos alces residente de algumas centenas. Eles têm seus bebês em toda a bacia, bem como em e ao redor do cabines, alojamento, e ao longo da estrada. Uivar para os lobos à noite, desfrutar há luzes da cidade até aqui e muitas estrelas brilhantes e um céu bonito grande! Estamos aberto próximo ano. A beleza nunca pára! Uma casa de banho no andar de baixo, 3 em cima. King Master e quarto antigo tem anexado, e 3 quartos rainha têm casa de banho entre eles. O rancho apenas abaixo da estrada meia milha tem passeios a cavalo, churrascos, tirolesa. Rafting é, no fundo da nossa estrada, e os nossos outros vizinhos pecuária são inovador em um nascentes de água quente na parte inferior da nossa estrada sobre o rio Yellowstone. Temos cavalos e vacas de todos os tamanhos e personalidades que amam a atenção e trata de veges e frutas. Nosso velho laboratório amarelo, heeler azul e vermelho curador também estão de saída, bem como Maggie & Discoteca os gatos, todos os animais ao ar livre. Ano em torno de cabras da montanha branca você pode ver com telescópio da frente do lodge. Montanha ovelhas, antílopes, alces, veados, búfalos e animais selvagens que vagam menor sazonalidade no rancho e, no fundo da nossa estrada. McDonald Lodge was the perfect choice for a reunion of now-retired college friends. The setting was spectacular, with views across an open valley to the Gallatin Mountains. The log lodge was very spacious, with lots of seating on the main floor, and 5 bedrooms for our couples upstairs. We enjoyed spending time on the large deck, visiting, reading, or using binoculars to watch birds and elk. Kitchen facilities were great--any utensil or pan we needed was available, along with a variety of spices and other basics. The granite countertops worked well for our buffet meals often cooked outside on the gas BBQ. There was adequate seating either outdoors, or at two dining room tables indoors. I loved seeing the Big Dipper out my bedroom window at night, and hearing the elk bugle early in the morning. If there was a negative, it was the dim lighting throughout, due to such high ceilings and low wattage bulbs. Our group took excursions into Yellowstone (about 30 minutes through the town of Gardiner to the Mammoth entrance,) and to Chico Hot Springs (about 45 minutes) for soaking and dinner at the historic Inn. We also took the owner's recommendation for an easy hike along the Yankee Jim Canyon trail. We didn't mind the 6.5 mile ride along a single lane dirt road to and from the highway as the creek and fall foliage were so pretty. We would highly recommend this property to groups of family or friends. There were 2 other beds in open areas that would be great for kids, indoor and outdoor trampolines, basketball and foosball games, a variety of exercise machines, and the owners' friendly dogs paid us visits. Our stay at the MacDonald Ranch was FANTASTIC! Everything worked out perfect! 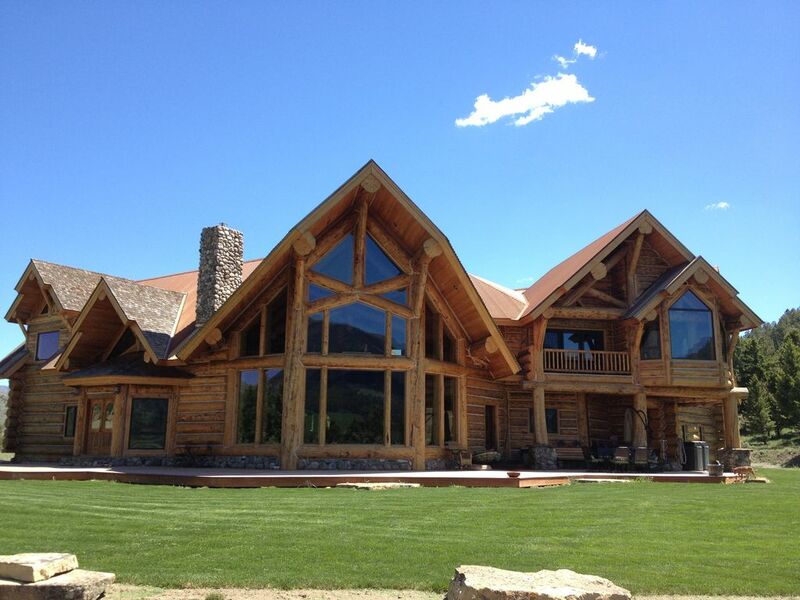 The lodge is absolutely beautiful, and the location perfect to experience the outdoors and to visit Yellowstone! We had our kids and grandkids and they all loved it!! Everything the logs of the lodge, the decor, the kitchen, toys & trampoline for the children, the climbing wall in the kids room..... all of it made our stay OUTSTANDING!! Thanks to all the MacDonalds for making our stay unforgettable!! The location is perfect to visit Yellowstone and experience the wonderful outdoors! We flew to Bozeman, rented a car, shopped at COTSCO, and drove to the Ranch (1:20 hours)! We got there and we couldn’t believe our eyes! It was better than the pictures! Beautiful!!! We put away groceries, got settled in, and then went for a short hike around the property! Met the horses, walked down the creek, and admired the beautiful sunset!! We enjoyed grilling, baking, and roasting marshmallows on the fire pit! and we spend most of our time enjoying everyone’s company admiring the view and the beautiful fire on the stone chimney! If we have the chance we would go back there in a blink!! House is beautiful. It’s a 20 minute ride up the driveway. Remote location saw plent of stars. Just stunning. Very nice, spacious lodge with large family room. Does need some organization of essentials. We rented it and an adjoining property, the "Schoolhouse" in July 2018 for a group of 17. The location was great, being a short drive from the North entrance to Yellowstone and the town of Gardiner. The drive to the property from the main road was a bit problematic for the people on motorcycles. It was a 6 mile, twisty, narrow gravel road on the edge of a creek. We were able to solve this by arranging to park the bikes off the main road, and the owners were nice enough to let us use their extra car to get the bikers up to the lodge and back to the parking every day. The kitchen was large enough to comfortably accommodate the entire group of 17 each night for dinner. We would have liked to see more utensils for a house this large, and normally we would expect that paper goods would be provided for our use. Although the kitchen did have most of the essentials we needed, it was difficult to find everything and it lacked organization. We arranged for a caterer to come in and prepare several of the dinners, which was a nice bonus. The owners were happy to provide us with firewood and a propane tank for the gas grill, and additional towels for our large group. The back patio was lovely and perfect for enjoying the outdoors. The master bedroom was awesome and had a large bathroom suite with a great shower. The Schoolhouse cabin on the outskirts of the property was a nice addition to accommodate those guests who could not comfortably fit in the main house. Our group was joined by some uninvited mice, which is understandable given the location, but we had to go to town and purchase additional traps for the frequent visitors. Overall, we were impressed with the home, the décor and the location. There was so much to do nearby: rafting, horseback riding and ziplining. This place certainly will be a great memory for years to come. This beautiful home is a great way to match your lodging with your Yellowstone experience. It's tucked in a beautiful mountain valley with Elk and deer that arrive in the evening and the morning. The lodge has a definite lodge feel with the decor and hunting trophies proudly displayed. The McDonalds are great to work with. We had a problem with the dishwasher and they came right over and got a repair man there the very next morning. Thanks for sharing your beautiful home. Making family memories!! Great place!! The views were incredible!! The house feels very warm and welcome. Everything you can imagine and more!!! Lodge & cabines privadas entre si nas montanhas log fora de Gardiner ao lado de Yellowstone Park, calma, a bela fazenda da família 5 geração com algumas das cabanas de madeira velhos para olhar. Completa com os animais amigável, animais selvagens no rancho e durante a sua unidade, e ainda perto de muitas actividades, incluindo Yellowstone Park. Podemos dar reembolsos, se pudermos re-reservar as mesmas datas, a mesma propriedade, menos US $ 75 de taxa de escritório. Somos como uma extensão para o parque. Nosso caminho é executado em Cinnabar Basin Yellowstone Old Trail no rio Yellowstone que leva você para o parque a poucas milhas antes de Gardiner. Ou você pode tomar a estrada paralela a ela, chegar Gardiner em primeiro lugar, em seguida, ir para o parque. Estamos a 20 minutos para a linha de parque, 25-30 minutos para a Estação Entrance Yellowstone Park no outro lado do Gardiner. 4 horas uma maneira de Jackson Hole Wyoming. Acomodação é a qualidade, confortável e aconchegante, com tudo que você precisa, quintal grande e poço do fogo, riachos e lagoas, os animais que visitam, belas paisagens. 6000 'lodge com toras maciças, espaçosos e confortáveis ​​para confraternizações familiares. Nossa fazenda vizinha tem tirolesa, passeios a cavalo, e almoços de churrasco. Essas atividades podem ser organizadas quando você chegar aqui, ou com antecedência. Eles também têm pacotes para incluir rafting. Temos uma maravilhosa fresco e justo restaurante preço 'O Farol' perto do mesmo local, no fundo da nossa estrada à direita da rodovia, fácil para ir ou voltar de Gardiner. O lugar favorito de minha família para comer, bem como nossos hóspedes. Temos cães e gatos que gostam de visitá-lo, assim como cavalos e vacas amigáveis ​​que todos amam atenção e guloseimas também. Eles são animais ao ar livre não são permitidos dentro. Encorajo uma caminhada fácil ao longo do Yellowstone Old Trail em Yankee Jim Canyon cerca de 10 milhas do nosso lugar vai em frente do parque. Você tem o rio cair abaixo do qual, por vezes, tem praias de areia para um piquenique, e você pode ver o antigo sinalização nas rochas significou para os visitantes do parque que viajam de diligência. Há muitos acessos públicos para Rio Yellowstone para fazer seu próprio pesca ou flutuante desde o Old Trail Yellowstone, no fundo da nossa estrada. Temos um riacho que corre todo o caminho através do nosso lugar e para baixo ao longo do nosso caminho para o rio. Você pode tentar a pescar algumas dessas manchas, bem, ele é um pouco mais complicado de pesca devido à salgueiros para os alces, e os peixes são mais ariscos. Eu posso enviar-lhe um e-mail áreas de interesse e com quem entrar em contato com detalhamento. Somos uma como uma extensão do parque Yellowstone. Claro, esses tempos podem ser interrompidos com animais que se interpõem no seu caminho, ou você está dirigindo mais devagar com a beleza. O lodge tem wi-fi por satélite. Se você precisar de alto uso, será adicional de US $ 10 por GB que é o nosso custo. Enviar e-mail a qualquer momento para qualquer dúvida ou informação necessárias para a área. Cancellations are refundable minus $75 fee IF I can re-book exact dates, same property. Check in is 4pm, and check out is 11am for all properties. Extra charges if excessive cleaning is needed, if garbage is not bagged and littering lodge/cabin, ranch grounds, as well if in cans/dumsters without bags. Extra charges if furniture is moved in any way inside and out. Cushions from couches, chairs etc are not to be taken off, are not to be put on floor or anywhere else, nor used for beds etc. We have satellite wifi. Not city wifi, but mountain wifi, can be slow. It is good for emails and occasional surfing web. Netflix cannot be accessed, nor should youtube or anything else be streamed. Dish network is the cable tv. We are in wild animal country, so always be aware of your surroundings. Never walk in the dark anywhere. Do not approach them, give them their space. Enjoy the beautiful scenery.